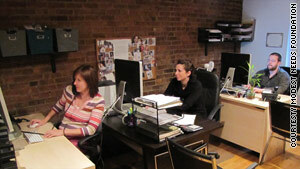 Staffers Fawn Volkert, Jennifer Elfar and Forrest Mason work on cases at Modest Needs' New York office. (CNN) -- CNN.com readers' response to a story Tuesday about a grass-roots charity has been anything but modest. "Honestly, over the last eight years at Modest Needs, I thought I had seen everything - every possible human kindness," Modest Needs Foundation founder and CEO Keith Taylor said in an e-mail. "But I have never, ever seen anything like the response we had to your story about Modest Needs today." Modest Needs aggregates small donations from thousands of donors, who can direct their contributions to help fund specific individual requests. One hundred percent of individual donations go to fund these grants, which cover needs such as auto repairs, rent, dental work or utility bills. On a very good day, Modest Needs will receive $5,000 in individual donations, Taylor said. A $15,000 day would be "absolutely unbelievable," he said. Prior to Tuesday, the most it brought in on a single day was $32,800, after Hurricane Katrina. In the 24 hours after this story appeared on CNN.com, Taylor said, individual donors ponied up more than $116,000 to help people through Modest Needs. A matching grant from the Zegar Family Foundation doubles the take to $232,000. "Truly, today I have seen the very best of all that makes us human at work through Modest Needs, and I came home today exhausted but elated and profoundly humbled by the number of people who discovered our work at Modest Needs today via CNN and made that work their own," he wrote Tuesday evening. On an average day, 1 percent to 2 percent of requests are funded. On Tuesday, 30 percent of people who asked for help got it. The average donation was $47 and the average grant was for $556. "What's even greater, with seven people we got all that money out the door," Taylor said Wednesday morning. "... Our receptionist also cuts all our checks, so as they come in she's cutting check after check. We got everything into the mail yesterday, so everyone who got help yesterday ought to have it in time for Christmas." Among those receiving grants was a woman in Altamonte Springs, Florida, who needed $600 to move into a new apartment after her roommate moved out on short notice. "Mere words can't express my gratitude for the outpouring of generosity afforded me," she wrote after learning her request had been funded. "What do you say to earthbound angels that have endowed you with a heavenly gift? I am humbled, honored and touched by your caring." A senior citizen on a fixed income received $770 for much-needed dental work. "I want to thank each and every person that gave to my cause," the Orange, Texas, resident wrote back. "My teeth are so bad and this means my life. All of you have made me so happy. Now I will have no pain, I can eat in front of people, and most of all I have my life back again. This is the best Christmas ever. ... You have reminded me that good still remains in our lives today. I can't thank you enough. You have changed my life forever." About 400 first-time contributors pledged to become sustaining donors with monthly gifts to Modest Needs, Taylor said Wednesday. "I've always said, just create the tool that will let people do what comes naturally -- which is, to most people, to be good to each other -- and they'll use it. And we proved that in spades yesterday."